A healthy, three month old grey seal pup resting on a Marshfield beach Friday had to be moved by the New England Aquarium’s Marine Animal Rescue Team to a more secluded location after well-intentioned but ill-informed beach-goers tried moving it back into the water. A stressed-out three-month-old grey seal pup tries to rest on a Marshfield, MA, beach after people tried moving it back into the water and repeatedly approached much too close. It was relocated by New England Aquarium staff to a secluded beach. The approximately 40 pound female had also been closely approached by many other people and dogs. When Aquarium biologists arrived, the young seal was shivering with fear, had labored breathing and showed signs of major stress from all of the unwanted and unneeded human interactions. 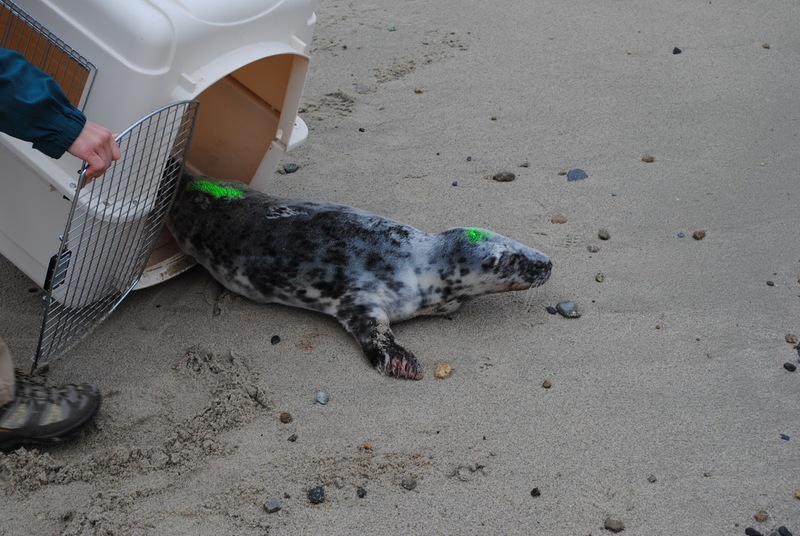 Aquarium staff relocated the weaned pup to a quiet, private beach in the area where it can rest and not be disturbed. A three month old grey seal pup is released and relocated by New England Aquarium staff on a secluded South Shore beach after it was unwittingly harassed by well-intentioned but ill-informed people. The green dye on its head and tail will allow biologists to easily identify the pup over the next few days as it is monitored. 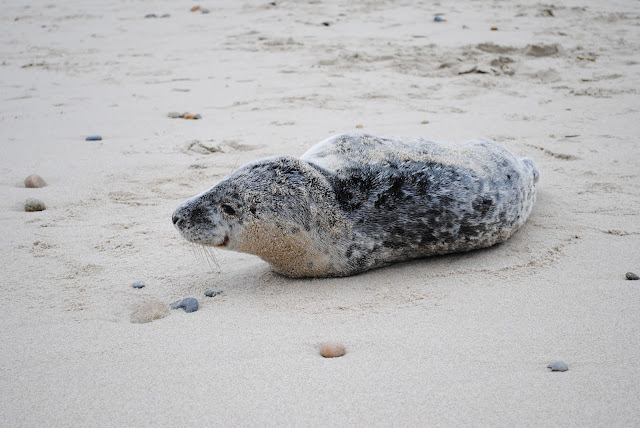 This grey seal pup was most likely born in January on a small offshore island south of Cape Cod. Its mother would only have nursed her for three to four weeks and then left on its own. This post-weaning period when the pup is learning how to forage and find its own food is a critical period when the animal’s health is highly vulnerable, and it needs lots of rest. Unlike other marine mammals like dolphins or whales, seals regularly haul out of the water to sleep and soak up the sun. When first seen in the morning, the pup was alert and bright. By the afternoon with continuous and too close human interaction, it was completely stressed out. For a wild animal on the edge of survival, this kind of event can directly lead to its demise. Grey seals are protected by the Marine Mammal Protection Act. Harassing them intentionally or unwittingly is a violation of federal law. More importantly, seeing seals at the shore is a relatively recent occurance and a great opportunity for a life-long memory. People can easily share the beaches with seals by knowing a few rules. Stay 150 feet from resting seals. If concerned about the health of the animal, call the Aquarium’s stranding hotline at 617-973-5247 or call your local animal control officer which can contact the Aquarium or the local stranding group. In the spring and summer, the vast majority of seals in prominent public locations are pups newly weaned and just learning to be on their own. They mostly need to be left alone. Getting too close has real health consequences for the seal pups. Enjoy one of nature’s wonders from a safe distance for both you and the animal.